A lot of people don’t let the Bible get in the way of what they believe. If you’re like most Christians, you believe in Jesus, but you’ve compartmentalised your faith so that your Bible beliefs only have a little influence over other areas of your life. This struggle includes a hot topic—abortion. "I will praise thee; for I am fearfully and wonderfully made: marvellous are thy works; and that my soul knoweth right well. My substance was not hid from thee, when I was made in secret, and curiously wrought in the lowest parts of the earth. Thine eyes did see my substance, yet being unperfect; and in thy book all my members were written, which in continuance were fashioned, when as yet there was none of them." The wording in the King James Version is a little difficult, but this is saying that God knew us in our mothers’ wombs. He considered us a person before we were completely formed and already had plans for our lives before we were born. So, if the Bible says that about the unborn, how can a Christian claim to follow Jesus and also believe that ending the life of the unborn is okay? All that this means is they have not been taught to observe all things that the Scripture says. "Go therefore and make disciples of all the nations, baptizing them in the name of the Father and of the Son and of the Holy Spirit: teaching them to observe all things that I have commanded you." "Then said Jesus to those Jews which believed on him, If ye continue in my word, then are ye my disciples indeed." It’s not enough to just get saved so you won’t go to hell. It’s not about an insurance policy. You have to continue in Jesus’s words if you’re going to be His disciple. This ought to be the goal of every single Christian! Yet it’s amazing how many don’t get this. They think the Bible shouldn’t influence what they think about economics, racial issues, marriage, or health. When someone like me stands up and shares how it should, most would say, “See, now you’ve gone to meddling. You just need to stick to preaching the Word and stop getting into politics and social issues.” But I am preaching the Word! It’s not me who is invading the social-political arena; it’s these things that are encroaching on what the Bible has to say. The Word of God has instruction for every area of our lives. If we don’t stand for what the Bible has to say, the unbelievers—who don’t have a biblical worldview—are going to be the ones establishing all the policies, determining what we can and can’t say and what we can do and can’t do. This is already happening, and many Christians have just accepted this. They have moved away from the words of Jesus. They don’t know what the Word of God has to say on all these things. You can love God and be liberal in your social views, but you can’t love the Word and be that way. You truly are born again, love God, and are headed to heaven, but you still hold viewpoints that are completely opposite to what the Word says. The reason for this is that you haven’t been taught “to observe all things” (Matt. 28:20). If you’re going to be a disciple of Jesus, you can’t only observe the parts that you like. If your attitude, your doctrine, or your worldview doesn’t line up with the Word of God, you need to change it, not change the Word of God. That’s big! You may be a believer like the ones Jesus addressed in John 8, and yet you haven’t continued in His Word. You may hold unbiblical views on the origin of creation, homosexuality, or abortion. “Amen” or “Oh me.” I’m not saying this to condemn you, but you need to realise that you cannot continue to do this and then call yourself a disciple. If you or someone you know is unsure about what I am saying, get my Choose Life! offer today. 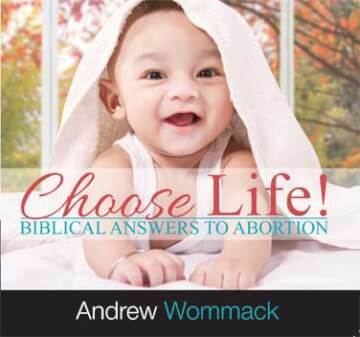 This offer includes the Observing All Things booklet and the Choose Life! Interviews and Testimonies USB drive, which contains real stories of people who have survived abortions. I won’t be trying to force you to change. I can’t do that. Only the Holy Ghost can bring change to a person’s life, but I think this teaching will really help you—and society as a whole—so I encourage you to get it. You can order this by going to awme.net, or calling our UK Helpline at +44 (0)1922 473 300.